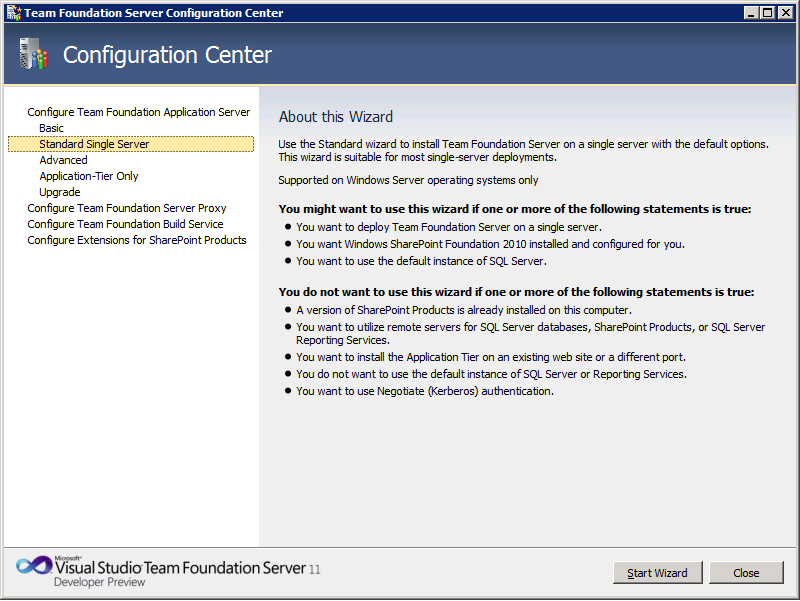 There is a developer preview of the upcoming version of TFS at the BUILD Conference in Anaheim this week, and I wanted to do a few posts on how to run through the various TFS install wizards. 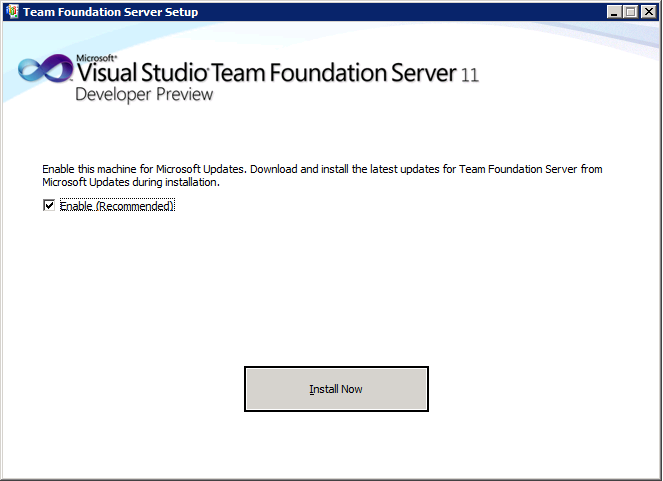 Installation of TFS vNext is very similar to installation of TFS 2010. 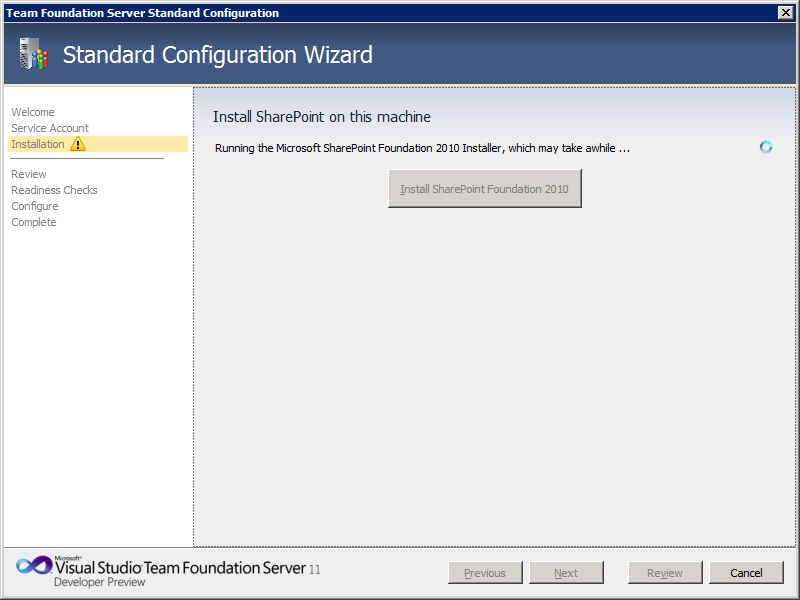 You can use the install guide for TFS 2010 to review the current guidelines for install. And you can find the late breaking information about this version of TFS install on the TFS setup forums. 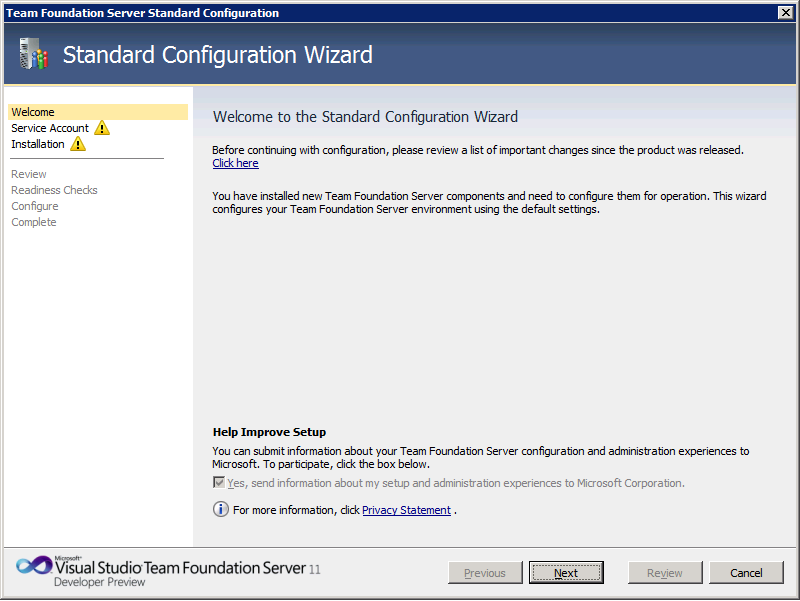 This post covers the Standard configuration option. This is the single server installation that uses all the TFS default options. The big change here is the addition of SharePoint Foundation 2010 and its hefty hardware requirements. More on that below. 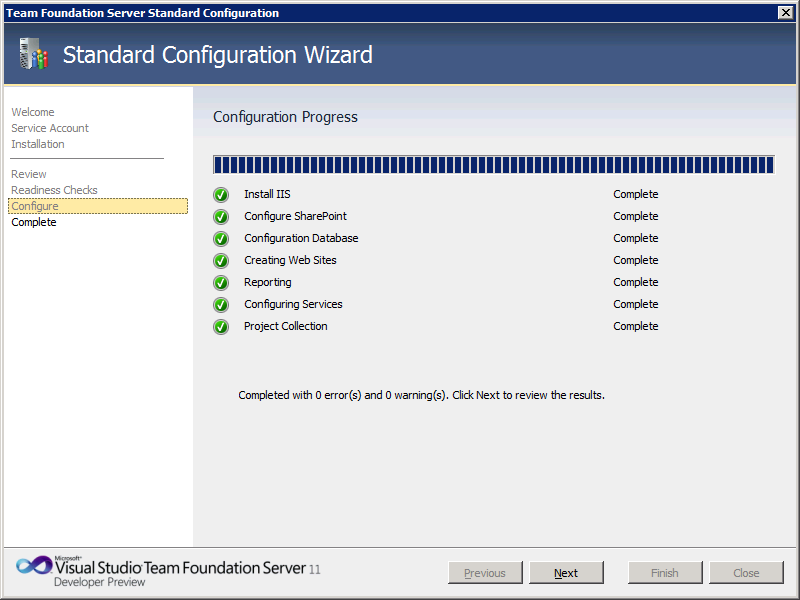 To use the standard configuration, you have to have a default instance of SQL Server and Reporting Services already installed. 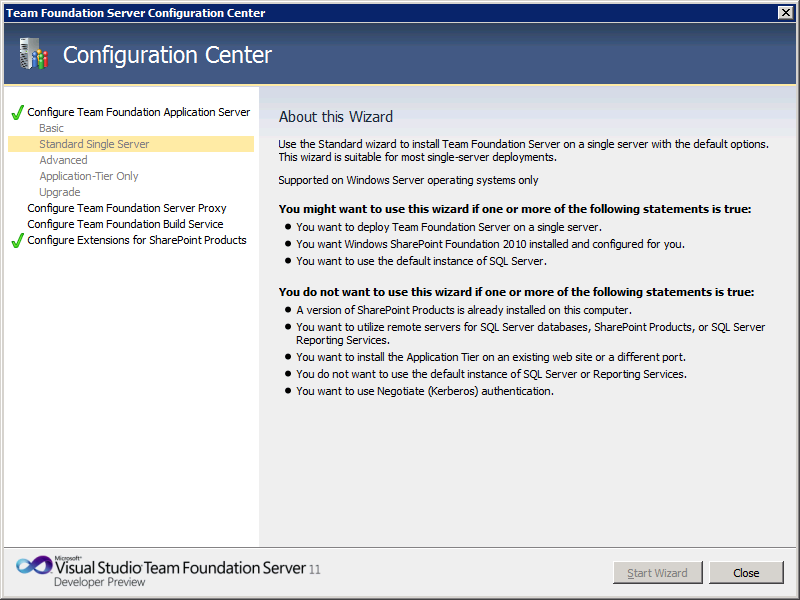 We install SharePoint Foundation 2010, which comes with Team Foundation Server, so you don’t have to install it yourself. But the system requirements for SharePoint are hefty enough to warrant a mention. You have to have 4 Gigabyte of RAM minimum to install. If you only have 4 Gigabytes, the installer complains that you don’t have 10 Gigabytes, but at least you can install. You also need 64 bit hardware and a Quad core CPU. 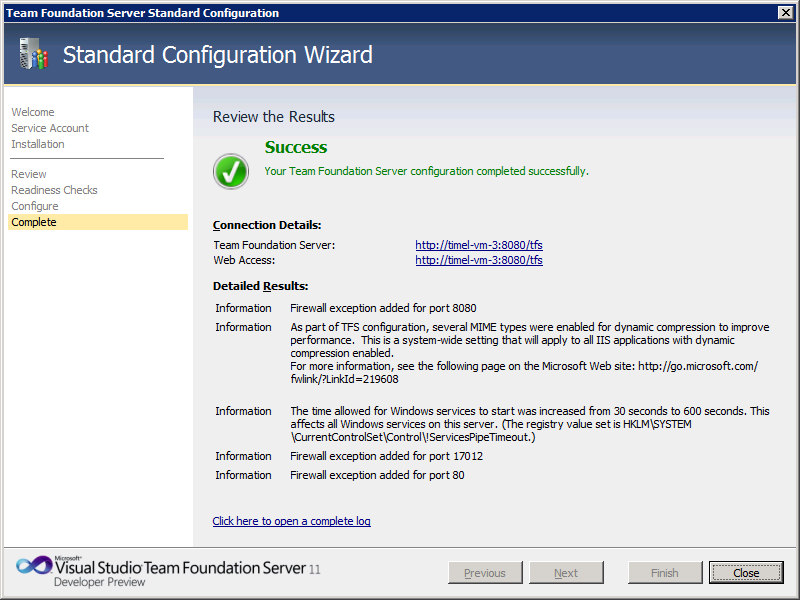 Look here for all the details on SharePoint Foundation 2010 system requirements. 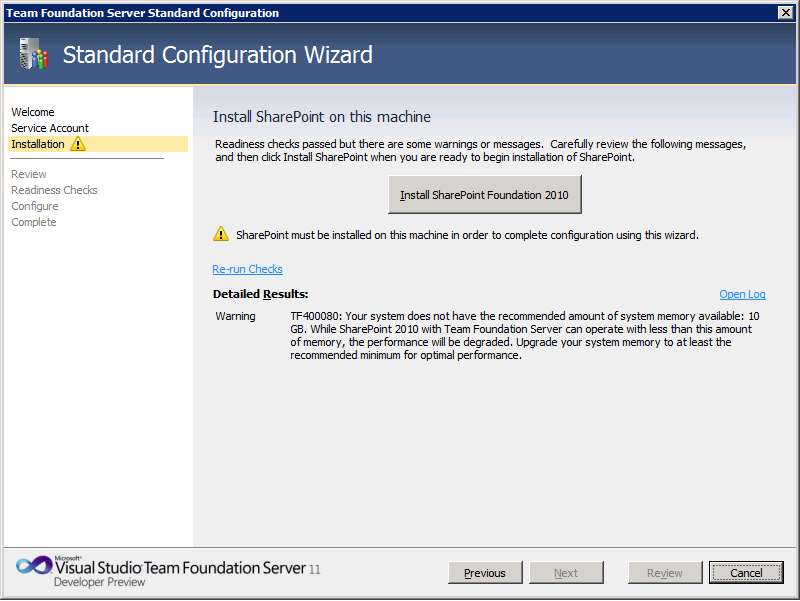 If you don’t have the hardware to handle the SharePoint requirements, consider using advanced or basic install options. 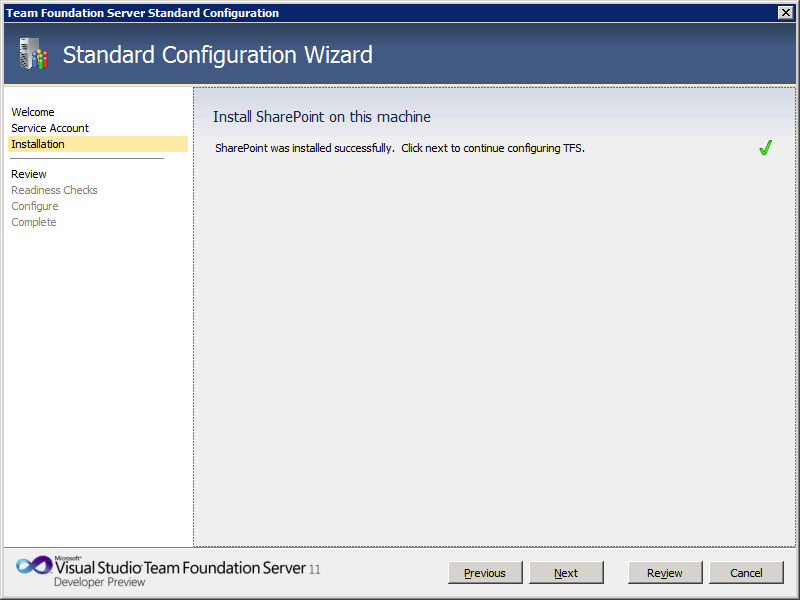 The advanced option allows you to customize your installation experience and basic doesn’t include SharePoint. 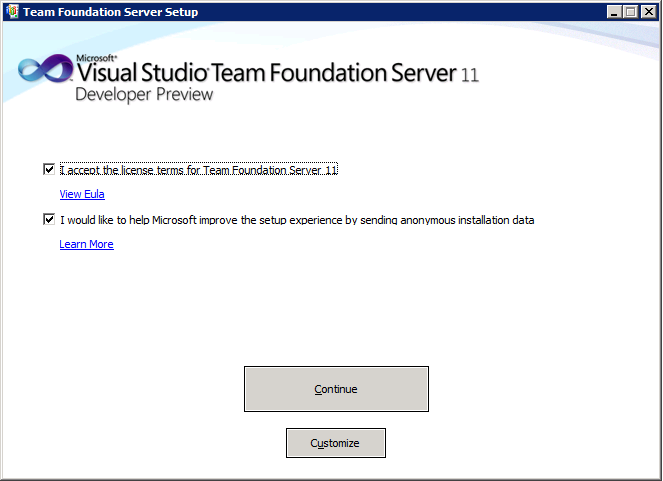 If you want help installing SQL Server for TFS, use this video I created for TFS 2010. The steps are exactly the same. 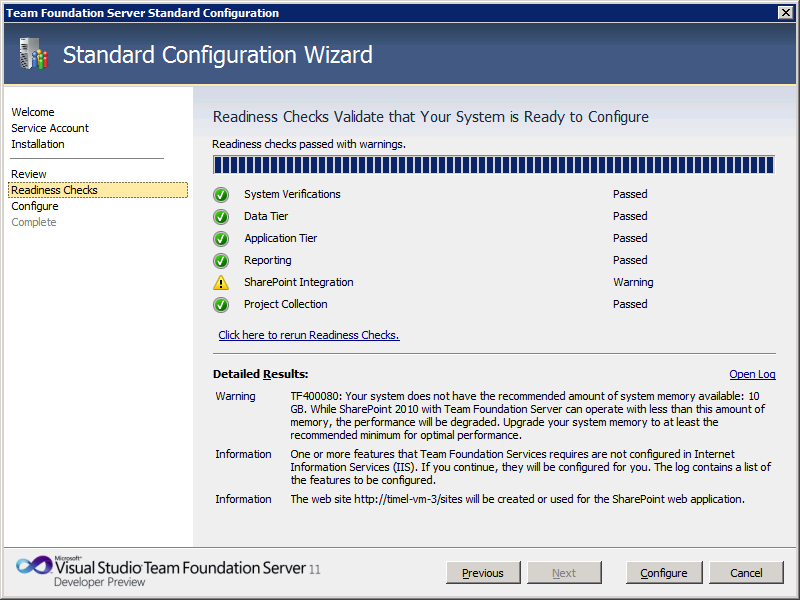 Select Standard Single Server, and then click Start Wizard. Enter the account you’ll use for the report reader account (TFSReports). 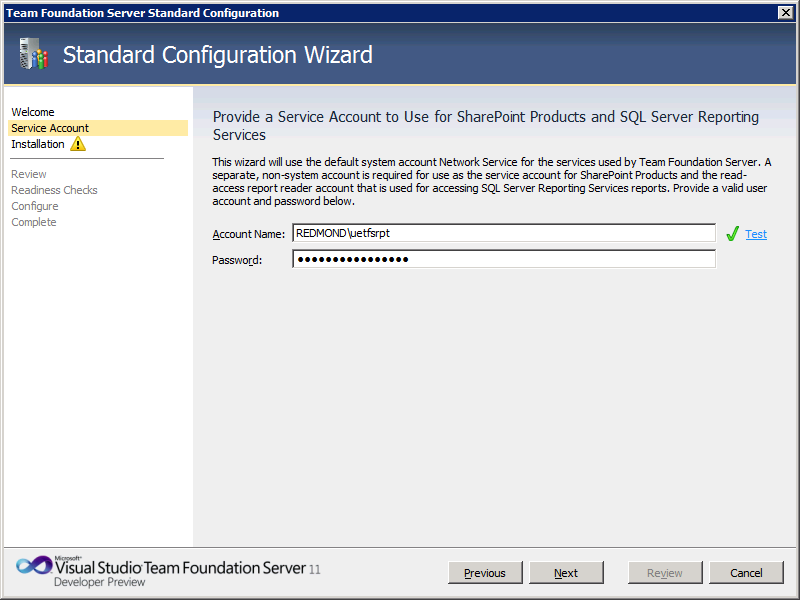 We use the account you enter here for both the SharePoint Farm admin account and for creating reports (TFSReports). 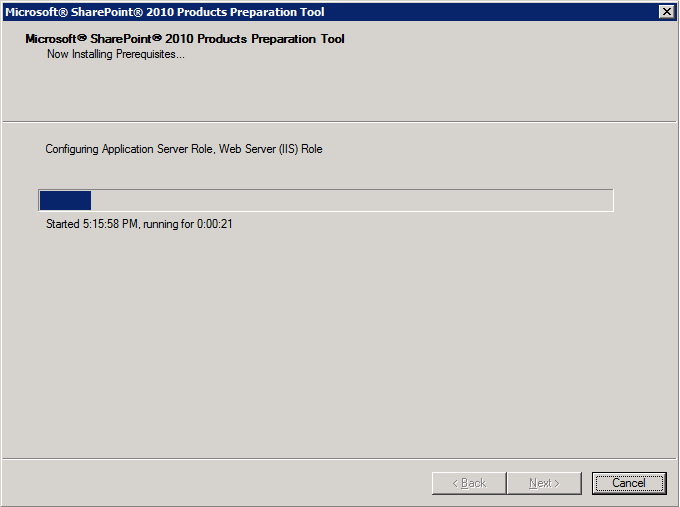 The SharePoint installer dialog appears (pictured left). When it closes, the TFS wizard churns a little more (pictured right). You can tell it’s still working by the little spinning dougnut shape at the top right. 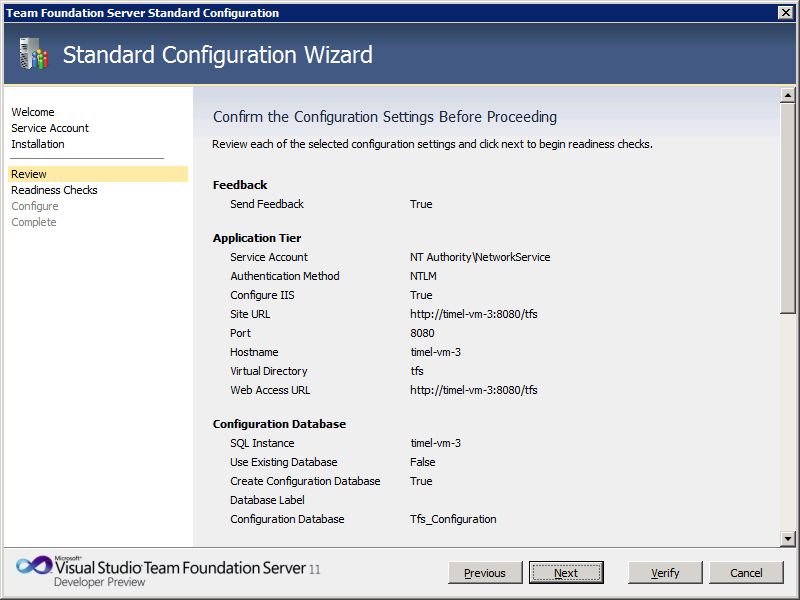 Categories: BUILD | Tags: BUILD Conference, SharePoint Foundation 2010, tfs installation, TFS Standard configuration, TFS vNext | Permalink.